The Chicago Cultural Center at 78 E. Washington St. is an under-appreciated gem of our city. The building is home to many interesting and often spectacular exhibits and events. Like concerts under the beautifully restored dome of Preston Bradley Hall. Art exhibits in the Sidney Yates Gallery and in smaller galleries around the building. There’s a comfortable seating area with tables in case you need a spot to rest or get some work done on the Randolph Street side of the building. Too bad the coffee bar is gone, but you can bring your own coffee in. 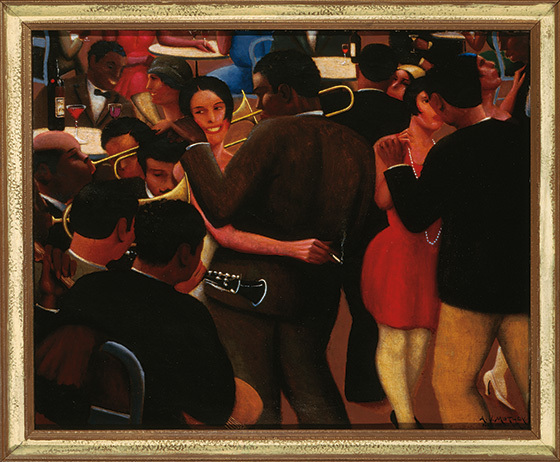 Right now the Sidney Yates Gallery is home to a fabulous exhibit of the art of Archibald Motley Jr., an African-American artist who studied painting at the School of the Art Institute from 1914 to 1918, whose work was exhibited all over the world and who won many honors. He lived in Paris for a time and traveled widely but he always called Chicago home. The exhibit at the Cultural Center is informative and well-organized and includes a substantial section on Motley’s early work. He’s best known for colorful urban scenes but his early portraits (like the one titled Mulatress with Figurine) are insightful glimpses into African-American life of the time. You’ll see portraits of his grandmother and of his wife, Edith Granzo. Motley was born in New Orleans in 1891 and his family moved to Chicago in 1894. He grew up in Englewood, then a German/Irish/Swedish neighborhood, but his social life and artistic inspiration was in Bronzeville. You’ll find exhibits on Motley, his life, thoughts and art in the corridor leading into the Yates gallery. 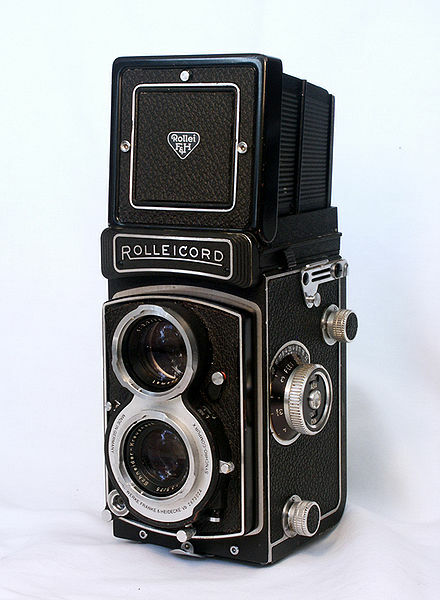 See my review in Gapers Block for more descriptions of the exhibit and of Motley’s work. The first time I heard of the Mecca, the grand old apartment building in Bronzeville, was when I read Thomas Dyja’s colorful cultural history, The Third Coast: When Chicago Built the American Dream. (The book won the 2013 Heartland Prize for nonfiction.) 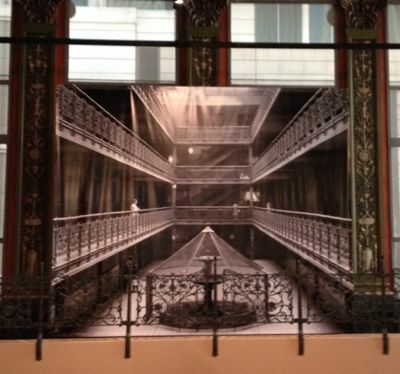 The current exhibit at the Chicago Cultural Center—Mecca Flat Blues—tells the story of the Mecca and how that very site became the location of the campus of Illinois Institute of Technology and of Ludwig Mies van der Rohe’s masterpiece, S R Crown Hall. 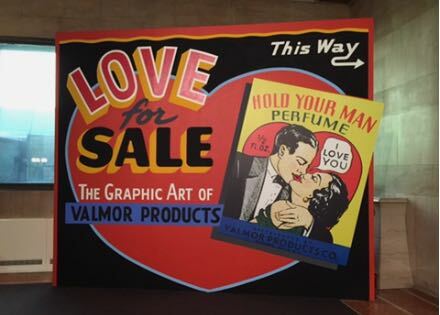 I just reviewed the exhibit for Gapers Block. You can read my article here. The Mecca was located on 34th and State streets. Amazing stories swirled around the Mecca itself from its opening in 1892 until its demolition in 1952. Dyja gave a lecture last week on “The Battle for the Mecca” and described how that one square block on 34th Street between State and Dearborn streets inspired so much. Gwendolyn Brooks’ great poem “In the Mecca,” was about the time she spent working there. A blues song from the 1920s, “Mecca Flat Blues,” commemorated the building, which was part of an entertainment district where jazz and blues flourished. When you check out my review, be sure to play the video of the blues song with audio from the original vinyl recording, played on a very old turntable. The Mecca was demolished and the site scraped clean to provide the site for the new IIT building. Dyja called it a palimpsest: a writing surface scraped clean for new writing on which traces of past writing remain. The exhibit continues in the Sidney Yates Gallery at the Cultural Center until May 25. See details at the end of my review. A note about my Gapers Block article: Chicago Magazine named it one of the “must-read articles of the week.” I was kinda pleased. My first visit to Crown Hall was an unforgettable experience for a longtime devotee of architecture and design. It was September 1969 and a major retrospective celebrating 50 years of Bauhaus art and design was on display at Crown Hall. Mies van der Rohe, its architect, was one of the many alumni of the Bauhaus who came to Chicago in the 1930s. Mies had died just the month before—in August 1969. I was living in DeKalb at the time and had never been to the IIT campus, even though I had grown up in Chicago—on the far northwest side. 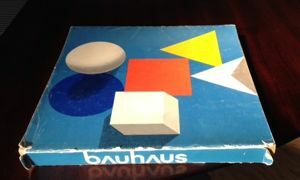 But I was a lover of Bauhaus design and the exhibit was something I could not miss. I started early, so I could spend a whole long day at the exhibit. I had seen small photos of Crown Hall so I knew the building I was looking for on the unfamiliar campus. But as I walked toward it, it took my breath away. The expanse of glass gleaming in the sun and the precision of the steel i-beams were simply stunning. Even though other Mies high-rise buildings are also considered masterpieces, this four-story academic building is much more elegant, because its entirety can be appreciated in one view. Original catalog from 1969. Photo by Nancy Bishop. The Bauhaus exhibit was very comprehensive and thrilling to see. Paintings, photography, architectural renderings and photographs, furniture, sculpture, pottery, typography by dozens of famous artists and designers. I was on sensory overload by the end of the day. I still have the square 365-page catalog, which I count among my treasures. 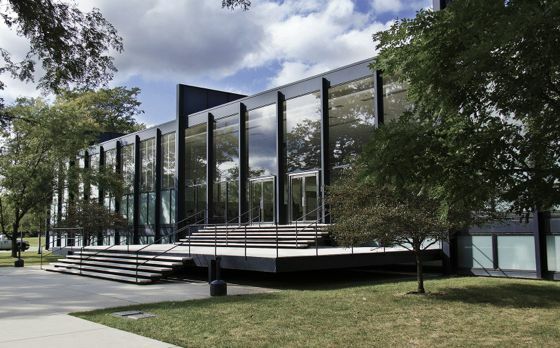 Another beautiful example of Mies’ low-rise designs is his Farnsworth House in Plano, Illinois—a museum house that’s open for tours April through November. Walking the Mies staircase at the Arts Club. Scroll down in my October post. Chicago’s Bauhaus legacy. See my comments on the great 2013 exhibit at the Ukrainian Institute of Modern Art.